On my first visit to Medina, I noticed an odd blend of modern buildings and traditional architecture, some of which resembled structures that can be found in Jeddah’s Al-Balad area. An attempt, it seems, is being made to transform the age-old Medina into a contemporary consumerist space. As a visitor to this changing city, I was keen to explore the surviving physical remnants of its past. More importantly, as a Saudi citizen, I wanted to interpret the city in the present and to imagine what it might look like tomorrow. Resting on the commercial passage between the Mediterranean Sea and the Indian Ocean, the cities of Hejaz were once characterised by the cosmopolitan traditions of traders and visiting pilgrims. The architecture of the Hejaz was known for its tall colourful stone and clay buildings that lined narrow alleys, designed to direct sea winds into the coastal cities. Hejazi architecture was influenced by a variety of regional styles and disciplines, from Malayan craftsmanship to the decorative details characteristic of Ottoman tradition. Most notable were the intricate wooden balconies (rawasheen), which helped circulate the breeze through buildings and to give women privacy from outsiders, while at the same time diffusing the glaring sunlight through the shade they provided. Hejazi architecture had character, functionality and a sense of time and place. I could hardly celebrate the preservation of anything visually reminiscent of a historical period, which albeit not long ago is virtually lost. One of the two holiest cities in Islam, Al-Medina Al-Munawwarah (The Enlightened City), was the city to which the Prophet Muhammad and his original followers migrated from Mecca, marking the Hijra (“The Migration” and the start of the Islamic calendar). Al-Masjid Al-Nabawi (The Prophet’s Mosque) served as Islam’s power base during its first century, and Medina became known as “The City of the Prophet”. The spatial character of the city began to change in the 1950s, with the renovation of The Prophet’s Mosque and the initiation of modernisation campaigns. Many of the city’s residents were forced out by the rising cost of land. In Medina today I was expecting to see steel, cement and cranes as the city’s expansionist projects continue. But I was hoping not to witness an imposing skyline like the one that surprised me a few years ago, during my inaugural visit to Mecca. Being aware of the Wahhabi destruction of early Islamic heritage sites, such as the mausoleums in Al-Baqi’, most of my anticipation of exploring Medina was to catch what is still standing today. The mausoleums in Jannat Al-Baqi, the cemetery where the Prophet’s companions and relatives were buried, were demolished in 1925. Marked by the foundation of the Saudi kingdom, the destruction of the historical sites was vindicated by the Wahhabi interpretation that reverence paid by visitors to such sites may potentially give rise to idolatry (shirk), contesting the very virtue of monotheism (tawheed). And so, the cleansing of sites linked to the founding figures of early Islam continued, while expansion projects were carried out in order to accommodate the increasing number of pilgrims in the city. 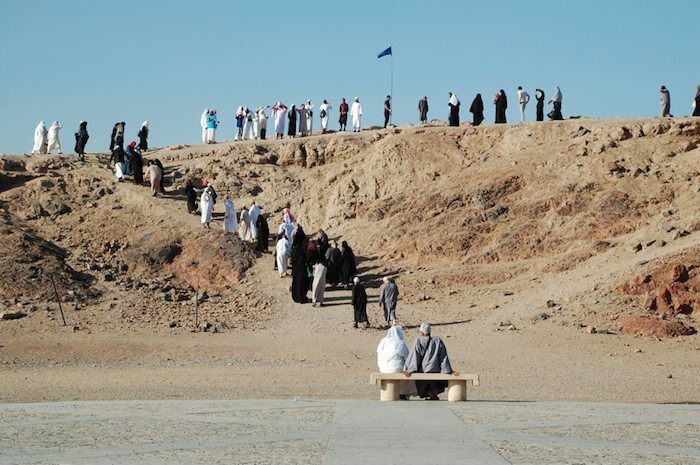 At the Uhud graveyard, people gather in front of the fence surrounding the graves of the Prophet’s uncle Hamza bin Abdul Mutalib and other martyrs, who died during the historic battle of Uhud. These tombs have been destroyed. On the fence, there are billboards with instructions by the Committee to Promote Virtue and Prevent Vice. A few men walked back and forth patrolling the fence, one of them told me to fix my hijab. There were countless vendors around, a construction site, and this fence. The Uhud graveyard, along with other historical sites, looked and felt hollow and spiritless. As I walked around the area surrounding the Prophet’s Mosque, occasionally stopping at a few shawl and rosary kiosks, I noticed commercial buildings, luxury hotels and fast-food restaurants. I spotted a Starbucks only a few steps away from the mosque’s entrance. Before entering, I stood in wonderment, overwhelmed by the visual distractions posed by commercial brands, advertisements, Saudi national flags and people drinking Frappuccinos. Was this the “sanctuary” that Medina was said to be? I observed people and wondered how they felt about what was happening around them. They didn’t seem as lost and disoriented as I was. The historical and spiritual significance of Medina is today largely overshadowed by demolitions and commercial development projects. On the subject of architecture, the Prophet Muhammad once advised: “La durar wa la dirar” (“There is no inflicting or returning of harm”). According to this, buildings should promote coexistence and peace; they should be functional, secure and respectful of the environment. Unfortunately, few of the social principles underpinning the tradition of Islamic architecture inform contemporary development projects in this holy city. Instead of creating a shared social space, these projects impose themselves on society, confiscating its identity. 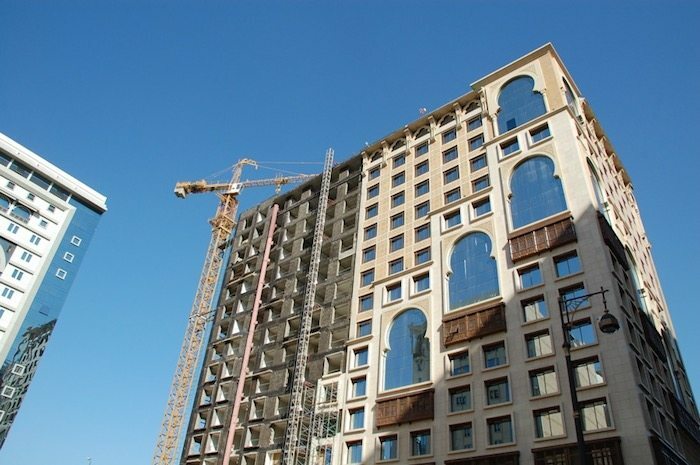 Hotels and commercial buildings have invaded public space, replacing historical and spiritual sites like mosques, tombs and houses. The Prophet’s Mosque used to be a centre of communal togetherness — the open ethereal space adjacent to it connecting people in the old city. It was a mediating place at the very core of the city, from which the streets branched out into the compact labyrinth that was Medina. The urbanisation concept that defined the physical Medina of the past had survived throughout the rule of different empires, all the while the mosque saw consecutive renovations and reconstructions — until recently, that is. Today, Medina’s natives and local residents are scattered across different parts of the city while shantytowns house migrant communities from places like the Maghreb and the Indian subcontinent. These areas looked similarly misplaced and alienated, which graffiti displaying issues of identity or place confirmed. Sadly, a city known in the past for its community was now rather visualised through its divisions. 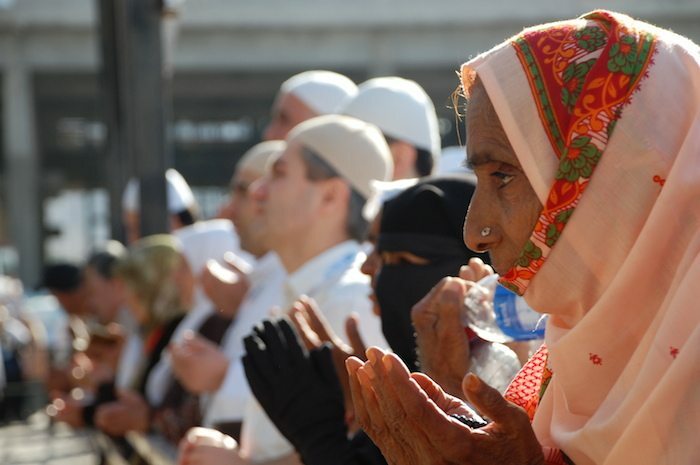 The promotion of social and equitable interactions, which once was at the heart of Islamic urbanisation and was a standard that defined Medina, seemed to have ceased to exist. In the street, I saw a banner that read: “Al-Madinah Al-Munawwarah: The Capital of Islamic Culture 2013”. The event was celebrated by a high-level delegation of officials and “prominent personalities” who discussed Medina’s past, its Islamic values and identity during the festivities. The city’s present however, seemed irrelevant. Perhaps the most telling thing was the opening of the occasion, which got postponed due to a logo dispute. The original logo, portraying the Quba (The Green Dome), was replaced with a new one depicting a map of the Muslim world. The Green Dome, beneath which lie the tombs of the Prophet and the first two caliphs, Abu Bakr and Umar, is a significant icon symbolic of the Prophet’s migration, as this was the first mosque to be built in Medina. The decision to change the logo was defended on the grounds that this image should not be used for commemorative purposes. The Wahhabis have their own beliefs regarding holy shrines; a statement by the Saudi Ministry of Islamic Affairs, endorsed by the Grand Mufti in 2007, proposed the demolition of the Dome. Perhaps then, the new logo provides a more honest portrayal of Medina as it exists today, given how unrepresentative The Green Dome has become. Rana has passionately been researching and documenting graffiti and street art across the Arab world since 2007, in search for counter-narratives of the Arab identity. Her ongoing project, 1001 Walls, has so far spanned twelve countries and given voice to society's silent cries, highlighting issues of censorship and the politics of space. She is currently pursuing her Master's in Social Documentation at University of California, Santa Cruz.